How Manhattan helps the student’s to get a good score in SAT Exam, 2018? Don’t let SAT examination 2017 give you anxious moments. 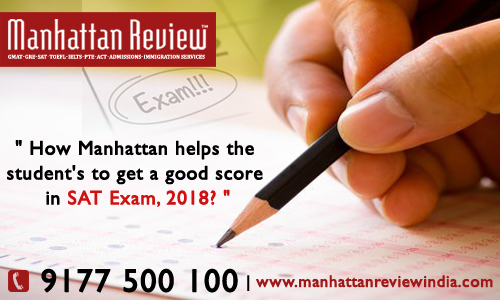 The big role Manhattan Review, India plays in helping the student’s to get a big score is truly amazing. The well-experienced team of trainers gives the best training in realizing your childhood dream of going to the US. Your decision to study abroad will be fulfilled here. The teaching levels are above international standards. Besides, the trainers go beyond expected boundaries to make you confident in facing the examination with a relaxed mind. Manhattan trainers adopt unique strategies in imparting knowledge of SAT. We do trace the progress attained by students in each and every class. We have our own classroom handouts prepared by SAT researchers in our team.This will support you to reach into your dream school of college. The trainers in Manhattan assist the students to solve the new questions with an open mind. The added benefit for the students to know the new strategy of acing the test. They offer more knowledge than what you learned in school. The curricula is awesome to ace the SAT test. Furthermore, they streamline the training according to the demand of the student’s and cover the weaknesses in a clever manner. The interior classroom of the infrastructure is soothing and breathtaking. In this way, they can concentrate on what they are learning. Manhattan PPTs and Video Tutorials help a lot in the training. The Admission Counseling Services (ACS) Team is there to give you directions on how to apply to the colleges or universities. For us each and every student is important. We provide complete information to pave the way for a bright future.